Put the ginger, garlic, chillies and fish sauce in a blender and whiz to a purée. Put the purée in a saucepan with the tomatoes, sugar and vinegar and bring to the boil. Reduce the heat and simmer, stirring regularly, for 20–25 minutes or until it’s a thick, jam-like consistency. Put it in a sterilised jar, cover with a lid and allow to cool; or, if serving with the thai chicken cakes, pour straight into a bowl to cool. 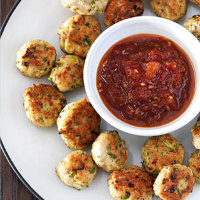 Serve with Rachel Allen's Thai chicken cakes.